I just picked this up off of e-bay. I don't have any information on it yet, just this bad picture. The seller said that he thinks it is Iban. I have no idea. As usual I'm hoping someone can tell me more about it. The seller had it packed for shipping at time of sale but said the blade is over two foot long. Thanks. Last edited by Robert Coleman : 29th August 2005 at 02:07 PM. 75 views and not one opinion as to its possible origin or who made it? It is a monkey skull. The seller said that this was brought back by his grandfather after WWII. I'll admit I'm surprised too. Why aren't the PI people swarming on this one? Isn't it some sort of talibon? The origin was also the Philippines. There was a thread quite some time ago, perhaps someone could help in finding it ? What did the blade on the one you had look like, did it look like the one on mine or was it of a different style alltogether? Robert , when you get it better pictures and measurements will tell us more . The blade profile seems not quite right for a garab or talibon ; too much belly too far forward . Thanks for your help. The two links you posted are the first places I look when I get something new. I will be posting more and better pictures as soon as the sword arrives. I was just hoping that with just the one lousy picture that I had of it with the very distinctive shape of the sheath and blade that someone might have an idea of who made it. Hi Robert. I can't find a pic of the whole blade, but here's one of the tip of the sword. It's very different of yours. If you look carefully at the first picture I put on this thread, you can see the shape of the blade. The sword has an open scabbard. The example that you show is a late 20th C. version of a pinahig from one of the Igorot groups, perhaps Ifugao or Bontoc. Robert's sword looks more like a parang nabor from Borneo, although I want to reserve judgment until we have much better pictures. The hilt appears atypical for a parang nabor but the blade looks right. Monkey skulls on sheaths seem to have become increasingly popular in the second half of the 20th C. Although there are older examples, I think this feature is largely an attempt to "dress up" recent offerings and make them more appealing to collectors. My thanks to everyone so far for their input. When I enlarge the hilt in Photo Studio it seems that it is carved in the shape of a demons head as Federico suggested. There seems to be a small round guard but I am not sure and I cannot tell if there is a leather throat on the scabbard. I will be posting more and better detailed pictures as soon as the sword arrives. Until then if anyone else has any more ideas on its age and origin please feel free to post them. Thanks again. This is the information supplied by the seller. "I believe this is a very rare IBAN traditional head hunting sword. The carving and decorations are very detailed. This is a piece brought home by my grandfather after WWII that layed in storage for decades. The skull attached is from a monkey. The IBAN headhunters are of the Sarawak population in Borneo." Last edited by Robert Coleman : 2nd September 2005 at 12:49 AM. That would probably be a Mandayan scabbard you are recalling. I think some Borneo scabbards also have the "upturned toe" feature. How far is Centerville,KS from KC,MO? I wouldn't mind actually seeing that piece in person. Post close-ups of the hilt and the scabbard when you get it as well as the ricasso. Federico may be correct on the Panay origin, but I might even go further and say it's from Capiz or Aklan province on Panay island. If that's the case, the monkey skull would be consistent with the area. However, Ian does make a point that the blade looks more like a parang nabur than a typical sanduko blade. Anyways, post better pics when it comes in and most likely someone here can probably better identify it. It's about 75 miles or so from KC, MO to where I live. I will be posting a lot more pictures as soon as the sword gets here. If you still want to see it in person we can arange something later this fall after I get done with my next surgery. Did you say San Miguels? Very tempting !!! Make it Red Horses and I'll be there tomorrow! Robert, sounds good! Post pics. If you're ever in KC just email me and we can arrange a meeting. I'll even let LabanTayo know so that he can bring some of his stuff over. Sounds great. Let me heal up a bit and I'll e-mail you and we can get thing arranged. Must be somewhere up there we can get a few Red Horses. I'd love to come to Minnesota but I'm afraid I'll have to pass, at least for now anyway. I hope to be able to meet a few of the forum members some day. OK everybody, here are more pictures and info. The pictures are still not the best quality because of it being a very sunny day but I think they will give everyone a good idea of what it looks like. Blade length from hilt to tip is 18-3/4 inches. Blade width at wides point is 1-5/8 inches. Blade width at the narrowest 5/8 inch. Blade at thickest point is 5/16 inch. The blade is bevel sharpened on one side only like a talibon. The skull looks to me like it has been part of the scabbard dress for quite a long time, if not from the beginning. Last edited by Robert Coleman : 6th September 2005 at 08:20 PM. Interesting sword, Robert. I like it very much. I've got little to add to the prior observations. I agree with Ian that the blade profile strongly resembles that of a parang nabur. The handle is similar to some I've seen (parang nabur without knuckle-guards are, apparantly, rare but not unknown), but the angle of mounting is unusual for that sword, and may be partly responsible for a vague talibon appearance. The scabbard is not very helpful, nor is the monkey skull. The scabbard construction of two pieces of wood bound together by plaited rattan appears across SEA, as do monkeys (anyone feel confident enough to take a stab at identifying the species? ). 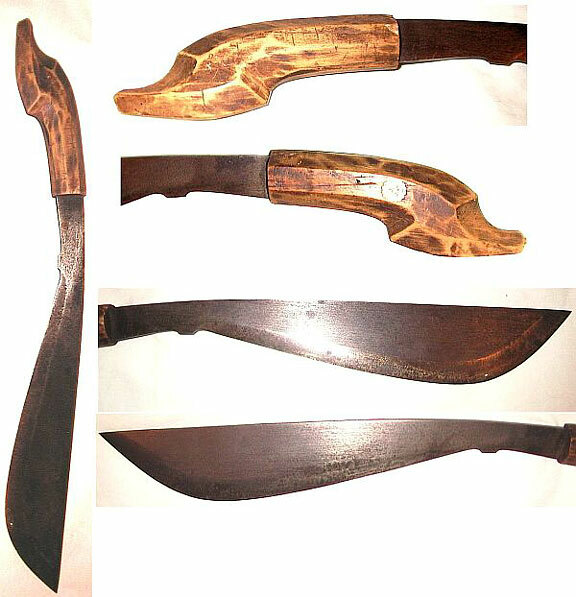 I'm going to default to a generic "golok" for this one for the time being. First, let's look at the blade. Andrew is correct that the blade does have a vague talibon appearance. In fact calling this a talibon or talibong would be acceptable since the term is a generic name for a fighting sword throughout the Visayas. The narrow ricasso is typical, while the blade widens towards the point. Also, the offset angle of the tang at almost 45 degrees is typical. This puts most of the weight of the blade towards the end making this a formidable chopper. The single bevel is also typical for a Visayan blade. Blades with these features are usually found on Leyte, Samar, and Cebu while the blades from Panay and Negros usually have wider ricassos with very little to no offset of the tang....there are those rare exceptions. But by looking at just the blade and the striking resemblence to the typical "talibon" blade, it appears that the blade is most likely from Leyte or Samar...maybe even Cebu. Next, let's look at the hilt. The hilt is a rather plain figural hilt. It isn't the typical Ilongo deity form or the Aklanon/Capiz deity form found on a Sanduko. Actually, figural hilts are quite common all over the Visayas....from Panay to Bohol. Figural hilts can be found on talibons, binangons, sundangs, sandukos, etc. The hilt really isn't much of a good indicator to the origin of this piece. However, the lack of a metal ferrule eliminates it from being an Ilongo piece (Eastern Panay/Negros Occidental.) The thin ratan band is mainly decorative which again is more consitent with pieces from Leyte, Samar, and Cebu. However, you will see this on a few sandukos and talibongs from Aklan,Capiz, and Antique IF there isn't a guard present. Finally, lets look at the scabbard. This is the part of the sword that is really confusing. First off, it lacks a leather throat piece typical of Ilongo scabbards. Also, the scabbard isn't completely straight and squared off like most Ilongo scabbards. This scabbard, however, shows more Aklanon/Capiz traits with the curled-up toe. This can be seen on the Sanduko scabbards where the toe turns-up to almost a 90 degree angle. Even recently made talibong scabbards from Aklan have this feature. 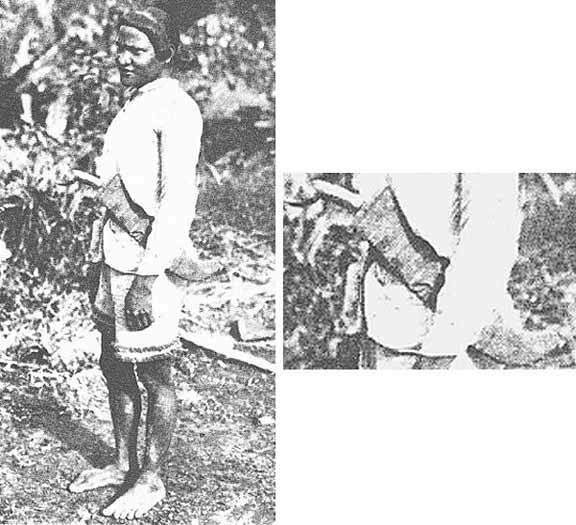 Scabbards from the Eastern Visayas (Leyte, Samar, Cebu) usually have scabbards that taper with the form of the blade and the toes of the scabbard usually turn up, but not that drastically as those from Aklan and Capiz. Looking at the just the shape of the scabbard, I would assume it was from Aklan or Capiz in Panay. But to add to the confusion even more is the way the hanger is set up. On this scabbard, it looks as if the top face of the scabbard was drilled through so a rope belt can be lashed on. This is usually seen on swords from Luzon and not the Visayas. In the Visayas a hanger block is usually carved out very prominantly and is drilled through. In Aklan and Capiz, the hanger block is slotted and not drilled through. As for the monkey skull, it looks more like a later add on. It actually looks like something you would see on an Igorot piece or other highland Luzon tribe. However, my sister did see a few bolos in Aklan that sported monkey skulls on their scabbards. I know she isn't lying since she wouldn't pick me up one since she's a member of PETA and is such a tree-hugging hippy that buying me a bolo with a monkey skull on the scabbard would be immoral to her. Well I didn't see any when I was there, but I did pick up a talibon with beetle wings on the scabbard. So where is the scabbard from? Good question, but it looks Aklanon to me. So where in the Visayas is this sword from? We can rule out Negros Occidental and Iloilo province on Panay which leaves us with a lot of territory in the Visayas. My guess would be Leyte based on just the blade, but I would guess Aklan or Capiz by just the scabbard. The sword is definately old and unique. Finally, I'll throw out another possibility...Mindanao. Not from the native Lumad tribes, but from the number of Visayan immigrants that settled there. This sword could be from around Ozamis, Cagayan de Oro, Iligan, Butuan, etc. There are a number of Visayans living in Mindanao that may explain those oddball swords with both Lumad and Visayan features...something else to think about. here is a shot in the dark-Siquijor, located to the south of Negros, Cebu, & Bohol & north of Mindanao. The island of witches, still practiced today. The people are still known for demon images & monkey skulls. bill, good point on the Siquijor angle. the twine that binds the skull to the scabbard: what is it made out of? is it reed or plastic? The skull itself has a woven cord that seems to be made of ratan that holds it together as well as forming a loop for carring or hanging it, but that is not what holds it to the scabbard. It is tied to the scabbard by what looks like grass, reed, or some form of leaf fiber. There is no plastic on this anywhere. The hole in the top of the scabbard looks like it was drilled in from the front with the point of a knife. It also has the same type hole in the rear half of the scabbard that is inline with the hole in the front half. I thought this hole was more for hanging on a peg when not being worn than as a way of hanging it for wear as is would interfere with the sword being drawn from the scabbard. I believe the carved area on the front of the scabbard a few inches below the top where a small piece is broken away is where it would have been attached to a rope belt or possibly worn under a sash. I'm thinking that the missing piece might have been tang shaped and extended downwards toward the dome shape you see right above the skull. Then the belt or sash would slip between the dome and the end of the tang and slide upwards under the tang so the scabbard would be safely secured. I am only guessing as I really have no idea on how it was actually worn. My thanks to everyone so far in helping to identify this piece. Last edited by Robert Coleman : 11th September 2005 at 12:51 AM.